Event attendees don’t always remember the details about demos, vendors, or conference sessions. In fact, some can barely remember the keynote speaker. So what’s the secret ingredient to a memorable event? The answer is the event experience. Attendees remember the atmosphere, the connections they made, the new food they tried, and the new experiences they had. Above all, they remember the way they felt. When attendees look back on events they reconnect with the emotional experience. Emotions are tricky. Creating an emotional response without seeming insincere is not an easy task. On top of the million other things an event organizer must consider, how can they also design event experiences that complement stakeholders, sponsors, and appeal to attendees? It’s actually easier than you think. It’s all about empathy — put yourself in your attendees shoes and think of every process through the lens of the attendee experience. In this way you can take something as simple as event registration and flip it to a wow moment. Here are a few ideas to help you create “all the feels” for your attendees. The registration desk is your first opportunity to set the tone for your event and create a “wow” experience. You can beat congestion with new event tech like facial recognition, RFID badges, self-serve check-in, and an awesome event app experience. Delight attendees with speedy access, breezy check-in and then easy entry to sessions. Using technologies like TurnoutNow with your event app, event managers can attach beacons to every attendee badge and collect valuable information about attendee behavior, congested areas and wait times and then take immediate action to improve the experience. Attendees are wowed by facial recognition during event check-in. Image via Event Tech Live. An enterprise event can be massive in both size and scope — and overwhelming to an individual attendee. But it doesn’t need to be. Event personalization can be enhanced by technology to help you keep pace with customer expectations for personalization and make your event not an event for attendees, but an event for each attendee. Mass personalization doesn’t have to break the bank. Leveraging AI-powered recommendation engines surfaced within your enterprise event app will help you provide meaningful, personalized recommendations at scale for event elements like session recommendations, networking suggestions, trip planning ideas, and more. Because attendees have an immense amount of control over their mobile experience, the event app is one of the most personal communication channels available. It’s also one of the most effective — in-app messaging typically receives eight times the direct response rates of push notifications. During a tiring, multi-day event, attendees are outside of their usual routine. Perhaps they haven’t had time to work out. Or maybe they’re over-stimulated from the information overload, networking, and brand messages. Health and wellness experiences are welcome sanctuaries from the hustle and bustle of the event. Event attendees are attracted to experiences like vendor-hosted relaxation zones, petting zoos, yoga, and hiking as they make them feel good and offer them exactly what they need. These can be simple and low cost experiences that punch above their weight on the wowness scale. A dog petting zone helped attendees relax at Dell Technologies World. Technology is amazing at connecting like-minded people at events. But the real magic happens when technology brings people together in the real world. Social spaces offer a great opportunity to encourage meaningful experiences for attendees. Themed areas like the playground at the me Convention or Bumble’s Empowering Connections experience of 5-minute mini-golf at SXSW are great examples of how event organizers can bring people together and make connecting easier. 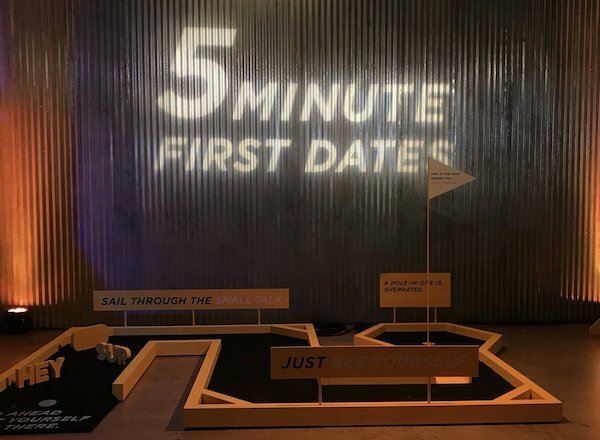 Bumble’s Empowering Connections activation at SXSW 2018 brought people together for a 5 minute first date. Image via Twitter. It’s important to give potential sponsorship brands the creative licence to execute on their idea — ensuring it’s complementary to the overall event experience. A less visionary event might have found Giant Spoon’s Westworld activation at SXSW risky as it pulls attendees out of the main event. SXSW embraced the novelty and, in return, received a major bump in press coverage—not to mention many delighted SXSW attendees. This year, Giant Spoon returned to work with HBO and Red Cross to recreate Westeros from Game of Thrones in an equally risque activation. When it comes to experiential marketing activations, partnerships can take many shapes and formats. From sponsoring the event app to deliver personalized attendee experiences, to event-within-an-event activations, to completely immersive experiences to bring entire new worlds to life, experiences can be crafted to fit any sponsor’s brand or budget. HBO and Red Cross teamed up to recreate Westeros at SXSW 2019. Image via Mashable. Events are all about the experience — attendee experience, speaker experience, and user experience. Take your event stakeholders on an emotional journey that is consistent with your event brand. They’ll appreciate the effort — and more importantly, the powerful memory of the experience will make them more likely to remain engaged with your brand.